UTHealth School of Public Health volunteers at the San Antonio Food Bank during the "Launch into Public Health" day of service. 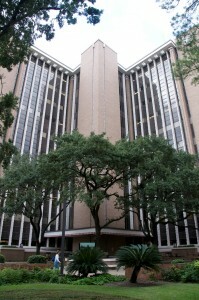 HOUSTON – Beginning the journey as a graduate student of public health, many students feel inspired and ready to dig in. This year’s orientation at UTHealth School of Public Health encouraged them to just that on its first “Launch into Public Health” day of service. The day of service took place just before Tropical Storm Harvey flooded Houston and delayed the start of classes by a week. The spirit of volunteerism was fully present in the school even before Houston and other areas of the Gulf Coast were in dire need of hardworking solidarity. UTHealth School of Public Health volunteers in the Houston campus Holistic Garden during the "Launch into Public Health" day of service. During each spring and fall semester orientation, the School of Public health holds a “t-shirt ceremony” similar in nature to the medical school white coat ceremony, during which school t-shirts are given to incoming students. T-shirts are given — instead of a more formal coat — as a representation of the importance of working side-by-side with communities to do community-based public health work. Getting sweaty and working hard were undoubtedly among the choices for students to volunteer on day of service at one of the following: the holistic garden at the School of Public Health in Houston; the Houston Food Bank; a CPR class held at the Cooley University Life Center in Houston; or at the San Antonio Food Bank (for those taking courses on the school’s San Antonio campus). At future orientations, students will be able to participate in the day of service on all six of the UTHealth School of Public Health campuses across the state, serving communities throughout Texas. UTHealth School of Public Health students learn CPR during the "Launch into Public Health" day of service. Although the day of service was optional, a total of about 100 students, faculty and staff chose to participate. In addition to serving as a day of volunteerism in public health, it was an opportunity for new students to meet and work with current students, faculty and staff members. In the holistic garden – part of the newly expanded facilities in the Dietetic Internship Program – students worked with the program’s co-director, Laura S. Moore, R.D., L.D., and Joe Novak, Ph.D., who teaches students about holistic gardening. The first order of business was to uproot the summer season plants to make way for the fall, and get the organic matter ready to compost. “Working in the holistic garden for the day of service gives new students the opportunity to engage in an activity within the School of Public Health community and to participate in the act of gardening while being in contact with nature — all while learning more about nutrition and the preventive health values of food,” said Moore. UTHealth School of Public Health volunteers at the Houston Food Bank during the "Launch into Public Health" day of service. CPR offered a different view of service — the opportunity to learn how to save someone’s life. First year student, Clarissa Sanchez commented on the experience. Students in both Houston and San Antonio working at the two food banks assembled at total of 1,634 boxes and food packs. In Houston, each box packed contained 26 meals, totaling nearly 24,000 meals. In San Antonio, the packs will help the Children’s BackPack Program. See photos from all four day of service locations here on Flickr.